Only weeks after it became operational around Mars‘ orbit, NASA’s Mars Atmosphere and Volatile Evolution (MAVEN) mission has uncovered a new process by which the solar wind can penetrate deep into a planetary atmosphere, past the ionosphere even this shouldn’t have been possible. It seems like a magic trick at the moment, but in time this mechanism might help explain how Mars has gone from an atmosphere rich planet, similar to the one found today on Earth, to one that’s less than 1% thick. This is the first time comprehensive measurements of the composition of Mars’ upper atmosphere and electrically charged ionosphere were made. 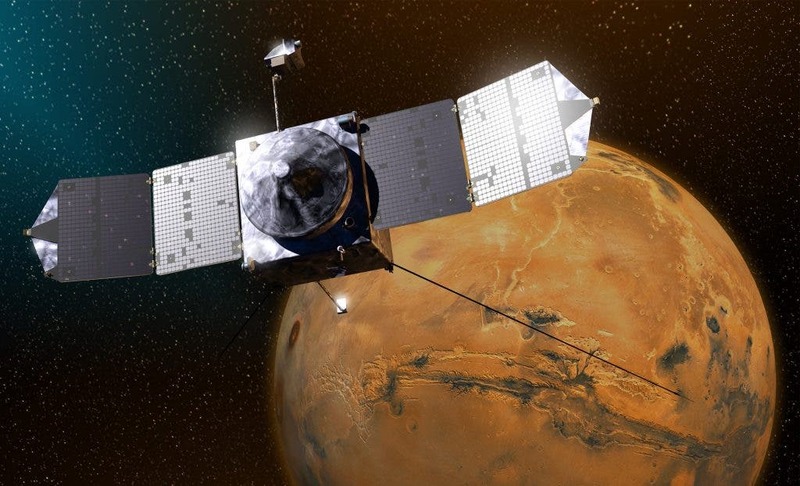 Each time it completes a full revolution around Mars’ orbit, MAVEN takes a dip inside Mars’ ionosphere – the layer of ions and electrons extending from about 75 to 300 miles above the surface which serves as a shield against solar radiation gusting from solar winds. Here’s where the funny parts starts though. In theory, solar winds – hot, high-energy particles – should be deflected by the ionosphere, so you’d think you can only detect these in the upper atmosphere. Considering MAVEN’s orbit, the probe’s instruments shouldn’t be able to pickup any charged particles when it dips through the ionosphere, but it has. MAVEN’s Solar Wind Ion Analyzer found solar-wind particles that are not deflected but penetrate deep into Mars’ upper atmosphere and ionosphere. What happens, NASA scientists reckon, is upper atmosphere interactions transform the charged ions into a neutral form that can penetrate the ionosphere shield. Once there, the stream emerges in ion form again, in all its former glory, retaining all its solar wind characteristics. Something fishy is definitely going on, and scientists believe this peculiar, Hudini-like mechanism makes it easier to link drivers of atmospheric loss directly to activity in the upper atmosphere and ionosphere. Using MAVEN’s Neutral Gas and Ion Mass Spectrometer, NASA scientists are now studying how gases are escaping from the upper atmosphere, where the loss is happening, by figuring out a connection between the lower atmosphere – close to the planet’s surface – and the ionosphere. Instruments so far reveal there’s an orderly structure of ionized and neutral gases in the upper atmosphere and ionosphere, in stark contrast to the lower atmosphere where the gases are well mixed. By studying variations in these abundances over time, researchers may gain new insights into the physics and chemistry of this region. The MAVEN probe arrived in Martian orbit on Nov. 16, after being launched in 2013.